A special thank you to Jo NY for being my tester. 2. I like to weave in the ends as I go. After fastening off a round I weave the tail through the back loops of the double crochets. After working the ch 3 and first dc I weave the beginning tail through the back loops of the dc of previous round. 3. Pay special attention to sewing the corners of the top square to the seams of the side squares. 4. Pull slipstitch tight, so that it nearly disappears. Ch 4, slipstitch in first ch to form ring. Round 3: Attach yarn with a slipstitch in any corner. Ch 3, 2 dc, ch 2, 3 dc in corner. *3 dc between next pair of 3 dc groups. 3 dc, ch 2, 3 dc in next corner. Repeat from * twice. End with 3 dc between next pair of 3 dc groups. Join with a slipstitch in the top of the ch 3. Fasten off. Round 4: Attach yarn with a slipstitch in any corner. Ch 3, 2 dc, ch 2, 3 dc in corner. *3 dc between next pair of 3 dc groups, twice. 3 dc, ch 2, 3 dc in next corner. Repeat from * twice. End with 3 dc between next pair of 3 dc groups, twice. Join with a slipstitch in the top of the ch 3. Fasten off. Join the five squares into a cross by holding the squares right sides together and whip stitching through the outside loops only. Now whip stitch the sides together from the center square down. 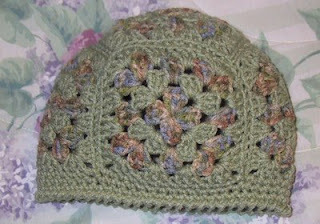 Fasten off and use your yarn needle to join and weave in ends. Leaving a 6 inch tail for sewing flower to hat, ch 4; join with a slipstitch to form ring. Fasten off and use beginning tail to sew to hat. You just keep outdoing yourself evey month. Love this hat, can't wait to start it. This is soooooooooooo pretty! Thanks for another faboo pattern! I really love all your patterns. Thank you for sharing them. Your hats look wonderful. I love the colors in your adult hat would you mind sharing them. I'm pretty sure those colors are Red Heart Super Saver in Frosty Green and Aspen Print. This is my first time at your site and I love this hat. However I am somewhat new to crocheting and would like to know what your abbreviation bpdc means, I have figured most of the others out. I just made this hat and absolutely love it! So simple to make. 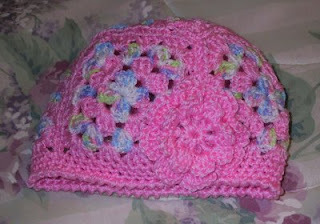 I have been wanting to make a granny square hat. Thank you for the pattern! I AM SO IMPRESSED WIT YOUR SITE.You are truely talented. I CALLED OR EMAILED ALL MY CROCHET FRIENDS TO TELL THEM ABOUT YOU.